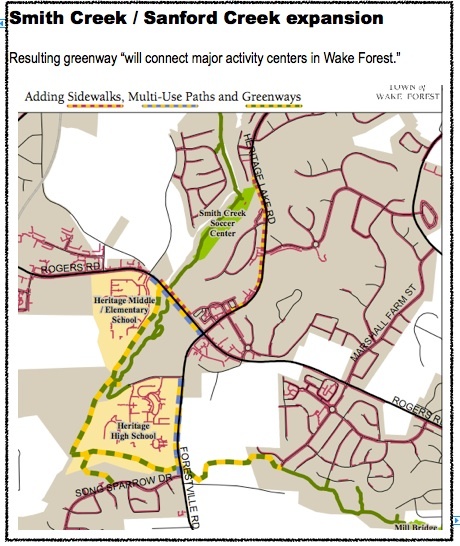 How yesterday's greenway votes in Raleigh, W.F., affect you - GetGoing NC! For more than a decade, the 3-mile connection between the Crabtree Creek Trail and Umstead State Park was in legal limbo, caught in a kerfuffle between the quarry that owns most of the land, the city and local homeowners. When the greenway access part of the dispute was resolved last year, it paved the way for including the project in yesterday’s bond package. Why is this 3-mile stretch especially important? 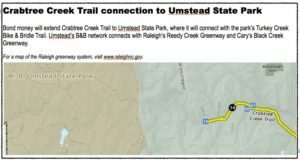 The resulting 17-mile Crabtree Creek Trail will link Raleigh’s Neuse River Trail, the backbone of Raleigh’s greenway system, with Umstead State Park via Crabtree Creek. 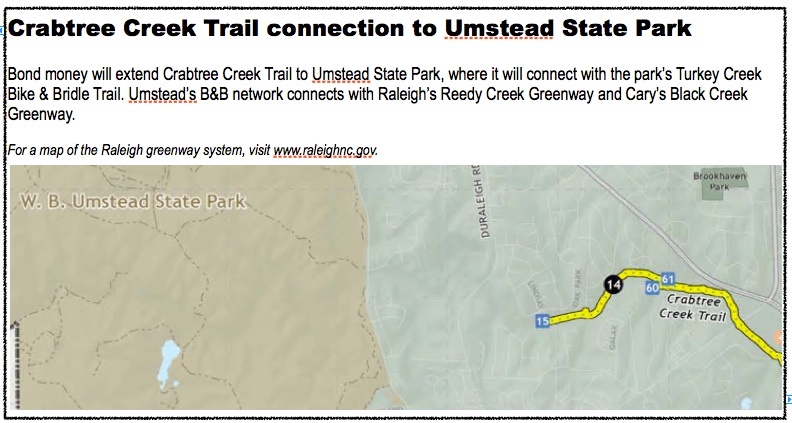 Utilizing 13 miles of bike & bridle trail in Umstead, it will then be possible to connect with Cary’s Black Creek Greenway, which links with Cary’s White Oak Greenway, which is a couple miles shy of linking with the American Tobacco Trail. The Neuse River Trail links with another 5 miles of greenway into Clayton. What’s that mean to you, the walking/running/bike riding consumer? It will be possible to ride a bike on path prohibited to motorized vehicles from Clayton in Johnston County to downtown Durham. 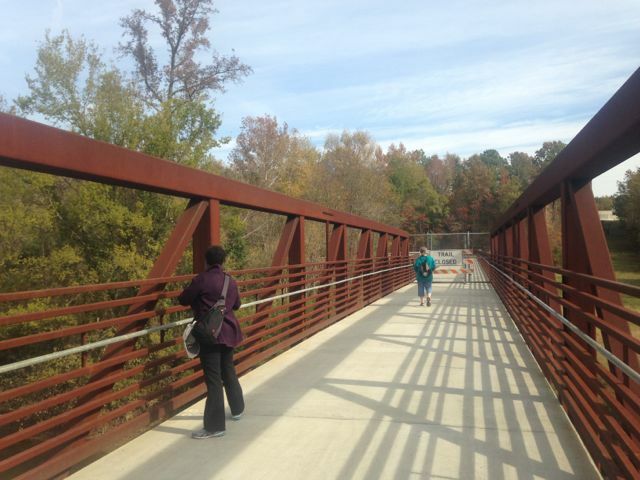 The 15.6-mile Walnut Creek Greenway also connects to the Neuse River Trail, running west to N.C. State’s Centennial Campus and, with a short sidewalk connector and road connection, on to Lake Johnson. That means you could ride from Umstead to Lake Johnson on greenway via the Crabtree Creek/Neuse River/Walnut Creek trails, though a faster greenway route would be to catch the Reedy Creek Greenway out Umstead and pick up the N.C. Museum of Art and Rocky Branch greenways to the Walnut Creek Trail and Lake Johnson. With the Crabtree-to-Umstead connection and a few short road hops, we will have roughly 150 miles of innerconnected, off-road, mostly paved, bike-friendly trail in the Triangle. The Raleigh bond package also includes $2 million to correct a hiccup on the Crabtree Creek Trail at Lassiter Mill Road that has long vexed walkers, runners and bikers along that stretch. As the Neuse River Trail is the spine of Raleigh’s greenway system, so is the Smith Creek Greenway to Wake Forest’s. 1.15-mile stretch running from Burlington Mills Road south across the Neuse River to Raleigh’s Neuse River Trail (see above). 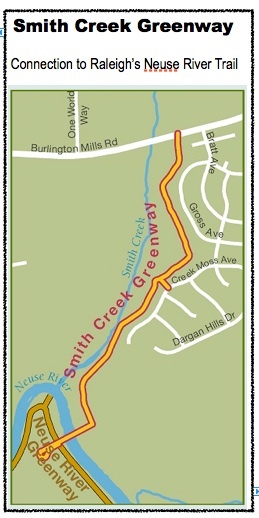 0.63-mile stretch that runs from Heritage Lake Road south through the Smith Creek Soccer Center to Rogers Road. Yesterday’s bond money will fund a link between the Smith Creek Greenway ending at Rogers Road with the Heritage High School/Middle School/Elementary School complex, then east along Sanford Creek to Mill Bridge Nature Park. That construction will include 2.4 miles of greenway trail and 1.25 miles of sidewalk and multi-use path in the vicinity of Heritage Elementary, Middle, and High Schools, and will link with 0.85 miles of existing greenway along Sanford Creek. The town is also using $3.4 million in federal Congestion Mitigation & Air Quality grant money on the project. Eventually, the plan is to build 2.5 miles of greenway linking the two stretches of the Smith Creek Greenway with the Neuse River Trail. Joe — can you provide an update to when the Neuse River Trail will open between the soccer center and Trailhead? Thanks! That stretch of trail just opened. I will have a post with details up shortly. Congratulations to voters in Raleigh and Wake Forest for investing in greenway connectivity!